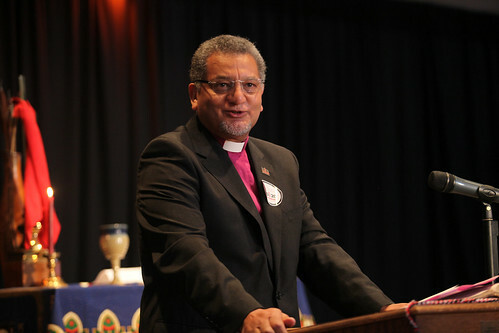 Bishop Ivan Abrahams, top executive for World Methodist Council, speaks at Lighten the Burden IV, sponsored by the United Methodist Global AIDS Fund April 23. CBS was filming the event for a show which will air June 17 called Helping Those With AIDS. A UMNS photo by Kathleen Barry. Click on image to enlarge. Walk into a Methodist Church in South Africa and one of the first things you might see is a big poster with a shocking statement: "The Church Has AIDS." Bishop Ivan Abrahams, top executive for the World Methodist Council and former presiding bishop of the 650,000-member Methodist Church of South Africa, is proud of those posters. In a country with one of highest rates of HIV/AIDS in the world, they are a symbol of churches starting to "put our houses in order." "Skewed" reading of Scripture has stigmatized people with HIV/AIDS and the Bible has been a source of pain and suffering, he said. Abrahams opened "Lighten the Burden IV," a one-day conference sponsored by the United Methodist Global AIDS Fund April 23 at Hyde Park United Methodist Church. The event preceded the April 24 opening of the 2012 General Conference, which will meet through May 4 a few blocks away at the Tampa Convention Center. The top legislative body of The United Methodist Church, General Conference meets every four years to determine church policy, establish positions on social issues and set the denominational budget. The United Methodist Global AIDS Fund was created by the 2004 General Conference. Since that time, more than $3 million has been raised and used for projects around the globe related to HIV/AIDS. The fund is administered by an interagency committee and chaired by the Rev. Donald Messer. It recently launched a new initiative: 20/20: Visioning an AIDS Free World. "Over the past 30 years &ellipsis; 30 million have died (from HIV/AIDS). Yet many of our churches won't devote 30 minutes to speak about it," Messer said. The real killer is the silence, stigma and exclusion suffered by those with the disease, Abrahams said. "AIDS is the new apartheid. I have personal knowledge of the ugly face of discrimination." Treating HIV/AIDS is expensive. It can cost $12,000 a year to treat one person, said Dennis Flores, a charge nurse in the AIDS unit at Grady Memorial Hospital in Atlanta and spokesperson for the Greater Than AIDS Campaign run by the Kaiser Family Foundation. Flores said 10 to 15 states are on the waiting list for medications used to treat AIDS. Pauline Muchina, senior adviser for UNAIDS and a native Kenyan, said she is inspired by what The United Methodist Church is doing. "We are at a tipping point," she said. "AIDS is declining; technology is working. The faith community needs to take ownership of AIDS." One of the barriers to eradicating AIDS is that it is no longer a "hot button topic," Messer said. "Poverty doesn't cause HIV but the two are closely related." Bishop Yvette Flunder, a clergywoman of the United Church of Christ, closed the event by saying the AIDS movement needs an epiphany. Flunder and her staff at the City of Refuge UCC operate the nonprofit agency in San Francisco. It provides housing, direct services, education and training for people affected by HIV/AIDS in the Bay Area, throughout the United States and in three countries in Africa. "The only way to end the epidemic is to speak it, make it known. The people of God need to decide it is time to destroy HIV/AIDS," she said. "The faithful need to get involved again, and we can stop this virus in our lifetime."